The FinEd Network organises an annual seminar, which in recent years has been arranged in connection with the FERA Conference on Education. The FinEd seminar acts as the pre‑seminar for the conference. 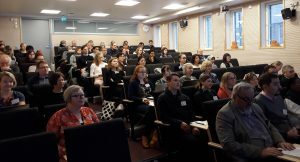 In 2018, the seminar was organised on 14 November in Tampere. Thanks to everyone who participated in the seminar! The next annual seminar will be held in the University of Eastern Finland, Joensuu, on Wednesday the 20th of November. The identity of an academic field is a fundamental question for researchers, but at the same time, it is an unresolved question. The identity of an academic field is always in the state of flux, under negotiation, always redefined. The identity is something that steers present decisions and aims of the future. This is why it is a most important question. The FinEd Network wants to invite junior researchers to participate in a discussion on identity of educational research and its future. Doctoral researchers not only need to identify their own position in the field of educational research but they are the makers of the future, their research re-forms the identity of the field. Panel members Professor Annalisa Sannino, Professor Kristiina Kumpulainen and Professor Risto Rinne discussing identity of educational research in Finland. The pre-seminar of the FinEd Network started with a session that addresses the questions of identity: Professor Harry Daniels gave a keynote lecture on identity in institutions after which the topic was elaborated in a panel and general discussion. In the afternoon, Professor Dorthe Staunæs discussed about feelings aroused by academic work. During the pre-seminar the participants had also an opportunity to present their ongoing work in parallel article workshops and receive feedback from the peers and senior researchers of the FinEd Mentor Pool. One of the main purposes of the pre-seminar is to offer opportunities for social sharing for the doctoral researchers. It aims at helping the participants to learn to know each other and the various research topics, getting acquainted with the senior researchers of the FinEd Mentor Pool and forming contacts for future cooperation. The pre-seminar ended up in an evening session with a dinner buffet that presented all participants a forum for free discussion and socializing.